View of Piscataway Park. Photo courtesy Accokeek Foundation. 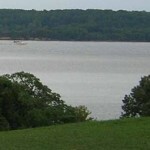 If you stand on the porch at George Washington’s Mount Vernon and gaze across the Potomac River, the beautiful wooded landscape that looks much as it did in Washington’s time is Piscataway Park. Washington wrote admiringly of that view, but the first written account of the landscape came from Captain John Smith. Smith visited the area now encompassed by the park in June of 1608, meeting with Piscataway Indians in a town called Moyaone, the political center of the Piscataway chiefdom. While the written record of the area dates back to Smith, archeological evidence shows indigenous occupation of the area for 11,000 years. 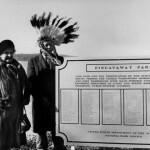 By the end of the 17th century, the Piscataway people had disbursed to other places and this land became an integral part of the tobacco culture that remained central to the Southern Maryland economy for the next three hundred years. The story of how this landscape came to be saved from development, becoming the first national park created through a public/private partnership, begins with George Washington’s view. 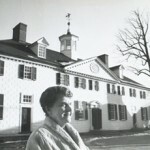 In 1955 Congresswoman Frances Bolton of Ohio purchased a 500-acre farm in Accokeek, Maryland, located directly across the river from Mount Vernon, to prevent its sale to a commercial developer. As a Vice Regent of the Mount Vernon Ladies’ Association, Mrs. Bolton understood the importance of protecting that iconic view. She was soon sought out by leaders from the Accokeek community who had been preserving the rural character of the area through a homeowner’s group (Moyaone Association) that limited the purchase of land to lots of no less than 5 acres with restrictive covenants prohibiting commercial use and limiting development and tree cutting. 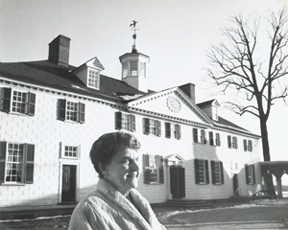 Accokeek Foundation Founder, Frances P. Bolton Admires the View from Mount Vernon. Photo courtesy Accokeek Foundation. As Robert Straus wrote in The Possible Dream, Bolton and her new associates determined that “the whole six-mile stretch of riverfront from Piscataway Bay through Marshall Hall… should be brought under control so it could not be adversely developed.” Their multi-pronged strategy to protect the view and the cultural and natural resources it encompassed included creating a new non-profit organization in 1957, the Accokeek Foundation, to lead the preservation effort. Mrs. Bolton donated her land to the Accokeek Foundation, and the Accokeek Foundation later donated the first parcel of land to the Department of the Interior for the creation of Piscataway Park. 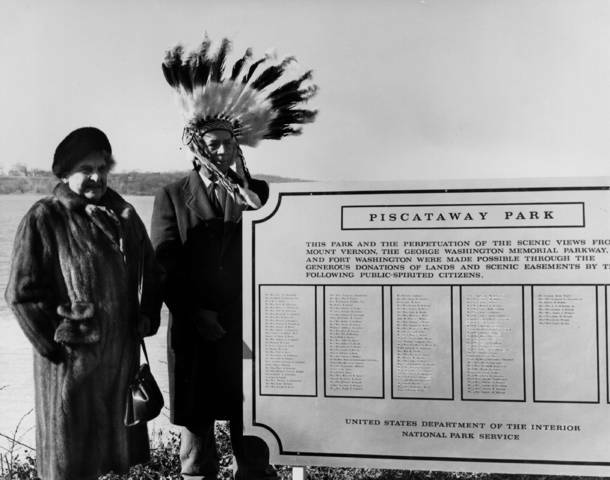 Frances Bolton and Chief Turkey Tayac at the Dedication Ceremony of Piscataway Park, 1962. Photo courtesy Accokeek Foundation. The Accokeek Foundation and its allies (the Moyaone Association, the Alice Ferguson Foundation, the Mount Vernon Ladies’ Association, and others) began a series of efforts that blazed new trails in the preservation world. They succeeded in getting state and county laws passed that provided tax incentives for scenic easements and with the National Park Service created a new kind of national park, one that included private land with donated scenic easements. The initial bill authorizing Piscataway Park was signed in 1961, the park was dedicated in 1968, and subsequent legislation expanded the boundaries of the park. Today the park encompasses 5000 acres. 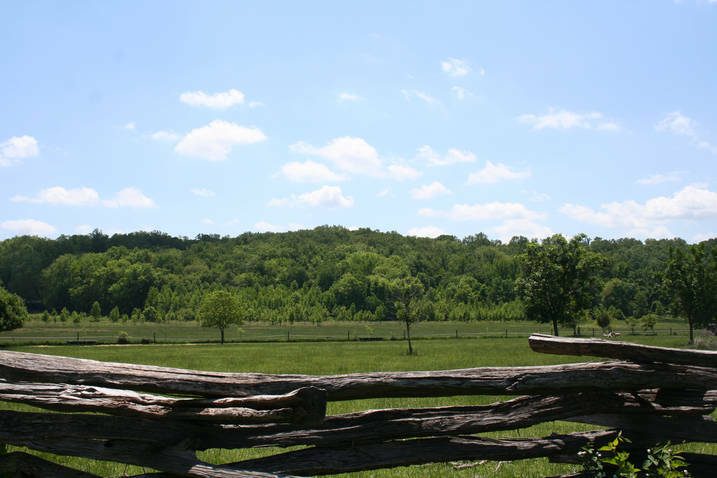 Several public access areas are managed by the National Park Service, but public programming and visitor services are all provided by the Accokeek Foundation at the 200-acres site it has stewarded through a cooperative agreement with NPS since 1963. The Foundation’s six trails, fishing pier, National Colonial Farm, and Ecosystem farm serve as an outdoor classroom, with a strong focus on the region’s agricultural identity. Potomac River views protected by Piscataway Park. Photo courtesy Accokeek Foundation. The success of landscape preservation efforts depends on communicating the landscape’s significance and working with partners. 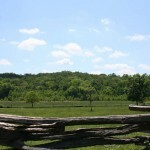 This landscape’s significance as an iconic view is well understood, and preservation efforts continue through the Accokeek Foundation’s network of dedicated partners, including the Mount Vernon Ladies’ Association, the National Park Service, the Maryland Environmental Trust, several national and regional land conservation groups, and planning staff in two counties. Less understood is this landscape’s significance to the Piscataway people, who in 2012 became the first indigenous tribes to be recognized by the State of Maryland. The Accokeek Foundation is now working with members of the Piscataway communities on a project called the Piscataway Cultural Landscape Initiative, a major effort to recognize to connect people to the environment in Piscataway Park through interpretation of the indigenous cultural landscape of the Piscataway people. A key partner in this work is the National Park Service, particularly the Captain John Smith Chesapeake National Historic Trail, which has identified indigenous cultural landscapes as a central interpretive them. Dr. Lisa Hayes is President and CEO of the Accokeek Foundation.